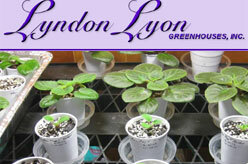 Home » New York » Listing » Flower Shops » Lyndon Lyon Greenhouses, Inc.
African violets, gesneriads, begonias, and other house plants. You can buy online. visit website. Delivery : United States / Canada / International. Inquiry for Lyndon Lyon Greenhouses, Inc.